New Fukuyume contains high concentrated C.G.F. (Chlorella Growth Factor) which is extracted from Chlorella pyrenoidosa (Sun Chlorella stain). In order to facilitate the consumption of C.G.F., Sun Chlorella successfully develops New Fukuyume by instantly drying as well as powdering C.G.F. and making it become tablets. 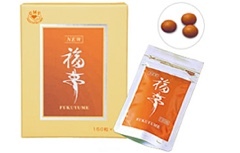 Moreover, New Fukuyume is coated with maltitol to decrease the daily intake of calories. New Fukuyume is very convenient for taking along leisure travels or business trips. It is also highly recommended to take New Fukuyume together with New Fukujin. Ingest 5-15 tablets a day with hot or cold water. Swallowing with water is only voluntarily recommended ingestion method however. Ingestion by leaking and chewing is just fine as well.